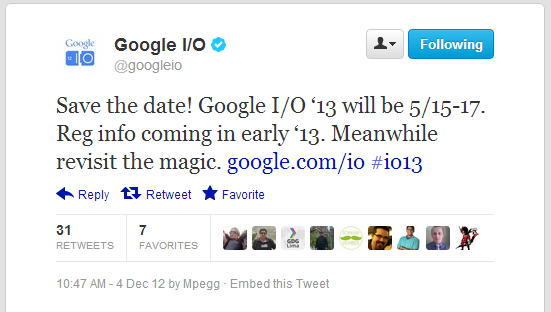 Today, Google has announced the dates for 2013’s Google I/O. Usually taking place at San Francisco’s Moscone Center, the event is scheduled for May 15-17 with early registration beginning sometime early 2013. Last year, we were introduced to the Nexus 7, Nexus Q, and Jelly Bean. This year, can we expect some Key Lime Pie? Any thoughts on what we’ll see in May?